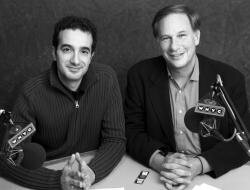 RADIOLAB’S JAD ABUMRAD AND ROBERT KRULWICH. Radiolab’s prize-winning essay “New Normal?” originally aired on National Public Radio’s WNYC on October 19, 2009. By building a radio program around reinterpreting what we think we know about the world, Abumrad and Krulwich have created a space in which skepticism and wonder can coexist—a space that ends up feeling like the sensation of essaying itself.